McGlathery Island was rescued from loggers and is owned by Friends of Nature, a conservation group. Going ashore is permitted. Stonington, a working fishing community and windjammer destination, is about 3 miles away on Deer Isle. 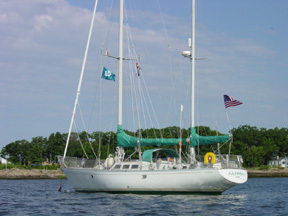 Billings Marine on Moose Island is about 3 miles from McGlathery Island and 1 mile from downtown Stonington. The Stonington Town Landing has a dinghy dock and short term tie up for big boats as well as a fuel dock. Tour the galleries and shops of Stonington, visit the Opera House, watch the fishing fleets unload their catch, and gaze at the schooners maneuvering in the harbor. Take a ferry boat ride out to Isle au Haut (home of Linda Greenlaw - the female captain of the swordfishing vessel in the Perfect Storm). McGlathery Island is a place to relax and take in some true Maine natural settings. Hike the Island, being mindful of the sheep, then walk the sandbar to the little adjacent island. Dinghy around the anchorage or stretch out on the sandy beach. You might even try swimming in the frigid waters if you are really brave. Moorings None at McGlathery Island. Billings has transient moorings. Call 207-367-2328. ; no launch service.